David Claypool Johnston "was the first American comic artist to have a sustained and popular career," as David Tatham, a Syracuse University professor of American art, commented in "A Note about David Claypool Johnston" published in the Syracuse University Library Associates Courier (spring 1970). Tatham further observed that "From about 1825 to 1850, D. C. Johnston was the outstanding comic artist of New England in painting and in the graphic arts. He was the first natively trained American to master with distinction all the various graphic arts processes of lithography, etching, metal plate engraving, and wood engraving." Tatham has generously donated several original examples of Johnston's work to Syracuse University Library. 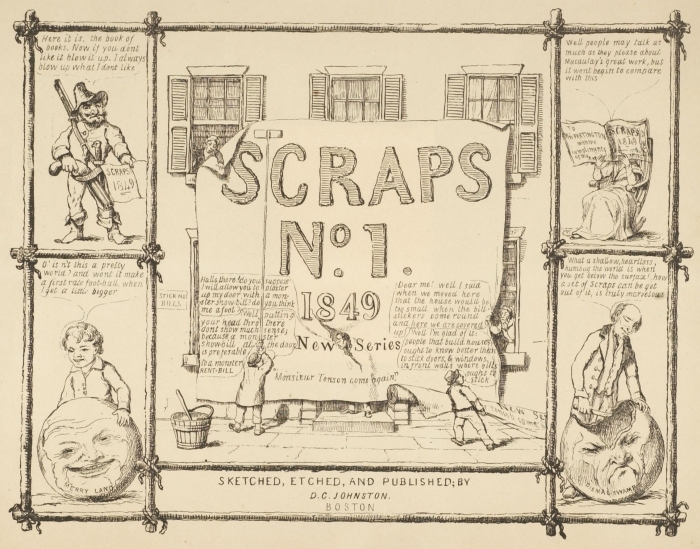 Scraps number one (new series) for 1849, "Sketched, Etched, and Published by D. C. Johnston." 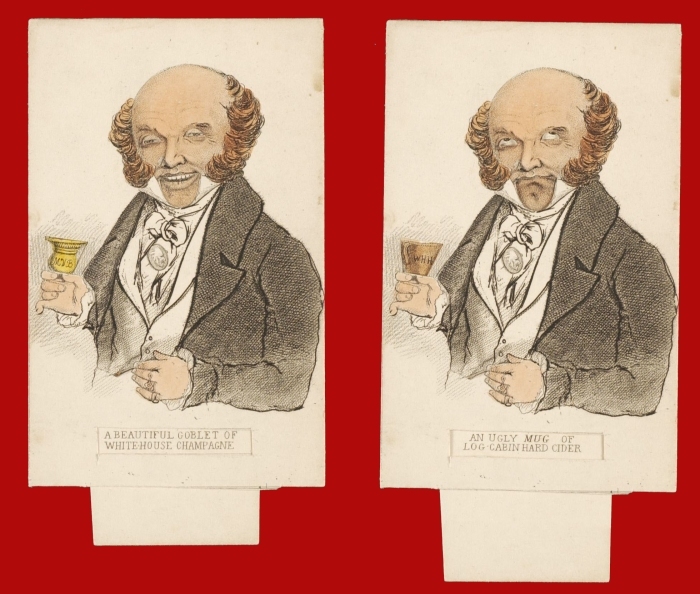 The British caricaturist George Cruikshank's Scraps and Sketches was published in 1827. We know that Johnston studied this work, and his own series entitled Scraps is perhaps his homage to this source. "Some of the richest and most complex of his conceptions were inspired by the literature for which he had no commissions....The best of these pictorial comments on literature appeared as etched vignettes in Scraps, Johnston's comic annual, of which nine numbers were published between 1828 and 1849" (Malcolm Johnson, David Claypool Johnston: American Graphic Humorist, 1798-1865). First Lesson in Portrait Painting. 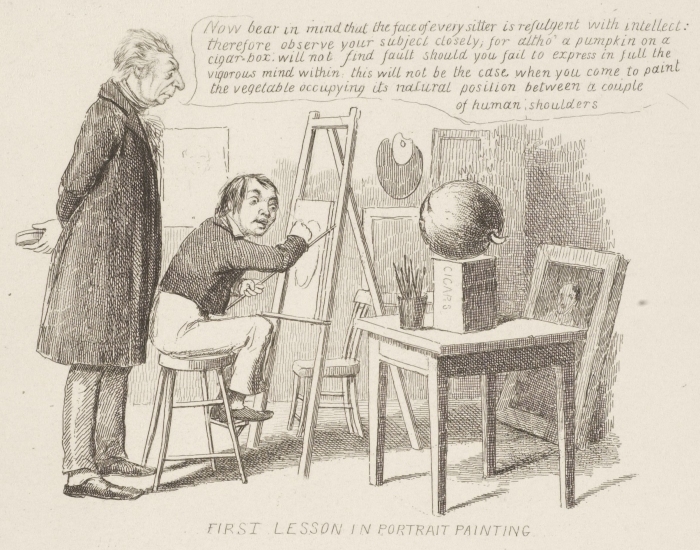 This cartoon by Johnston wryly suggests that a pumpkin can serve as an adequate model for teaching students the art of portraiture. Johnston was responsible for creating two of the earliest commercial art school programs in America. The Schoolmaster. 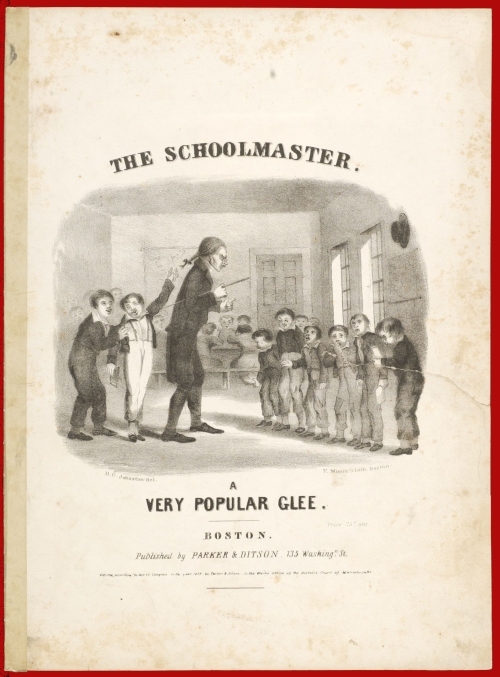 A Very Popular Glee (Boston, 1839) with the lithographic cover drawn by Johnston, a printed piece that was donated to the Special Collections Research Center by Professor David Tatham. Malcolm Johnson maintained in his publication entitled David Claypool Johnston: American Graphic Humorist, 1798-1865 (Lunenburg, Vermont: Stinehour Press, 1970) that "Johnston was responsible for the first dated sheet music cover with a lithographic illustration in this country, 'The Log House,' published March 14, 1826." Metamorphosis: Martin Van Buren. The inscriptions of "A beautiful goblet of White-House champagne" and "An ugly mug of log-cabin hard cider" applied to this stipple engraving and etching convey the transformation that resulted from William Henry Harrison's successful 1840 "Log Cabin and Hard Cider" presidential campaign against Martin Van Buren, who was depicted as a dandy in the contest. Metamorphosis: Jeff Davis after the Fall of Fort Sumter 1861. Jeff Davis after the Surrender of Fort Sumter 1863. 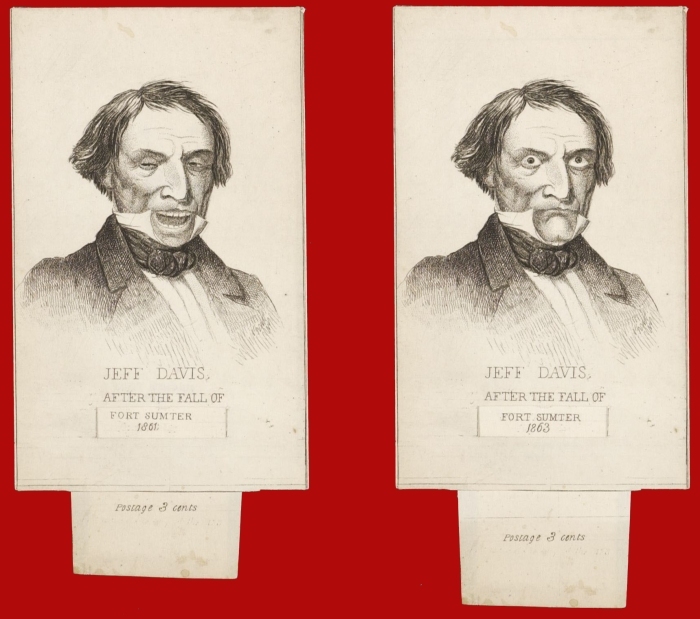 The change in the expression of Confederate leader Jefferson Davis reflects the shifting fortunes of the Civil War between 1861 and 1863. 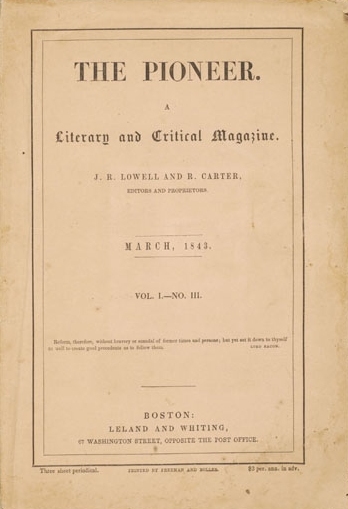 The Pioneer: A Literary and Critical Magazine, a short-lived publication edited by James Russell Lowell and produced between January and March of 1843. D. C. Johnston etched a rare contemporary caricature of Charles Dickens for its March 1843 number. 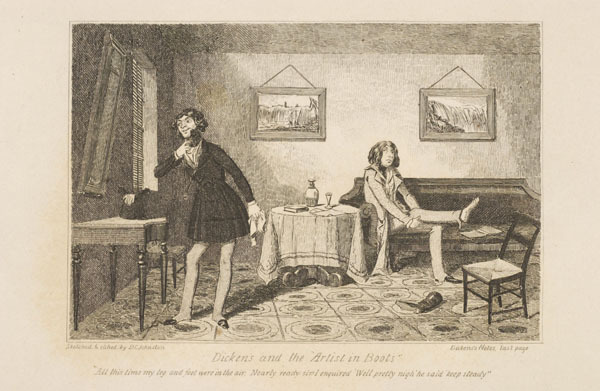 It depicts the "Artist in Boots," which refers to a chapter in American Notes by Dickens. Besides Lowell's own contributions to this journal, it has the distinction of carrying some of the first published work of Nathaniel Hawthorne, Edgar Allen Poe, and John Greenleaf Whittier.